SCOTLAND YARDIE - SKANK MARK TWO IS IN THE HOOD! 1) What are your own origins, Bobby? I am a proud sarth Londoner, and was raised and praised on comic books (as a lot of us were). I loved them and I still do. So back in the day (along with Michael Robinson, Daniel Francis, and Joseph Samuels), we went off and created comic books that appealed to us and people we know. We didn't know our comics would resonate so deeply back then, and now, years later. We just wanted to make ourselves plus the people we knew, laugh. The comics were satirical, they were edgy, they were in your face. Some would say I was a bit of a 'rude boy' as I was a bit of a rebel. But hey! We've all got to grow up sometime... and one day I will!! 2) Back in the day I remember ‘Skank’ being a big thing among our crowd. So from your point of view what would you say was it’s biggest achievement / flaw? Apart from it being bloody funny. It's biggest flaw was that the lack of distribution prevented it from being a bigger success. Our fans had to search out for us and we didn't exactly stick to a bi-monthly schedule (some issues came out a year apart). That said, I've got to give our readership props for their complete and utter dedication. The biggest achievement? Wow! There's so many!! My personal favorite is that I'm glad Skank is fondly remembered, and that people remember its impact twenty years on. It has been described as the comic equivalent of punk. Which is nice. 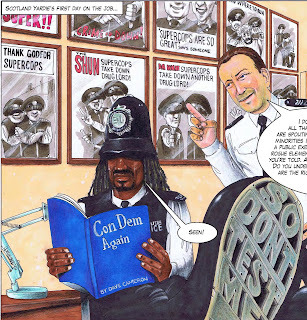 3) In your own words how would you describe your new graphic novel, ‘Scotland Yardie’? Scotland Yardie is the natural progression of Skank. Yet that was then, and Scotland Yardie is now. 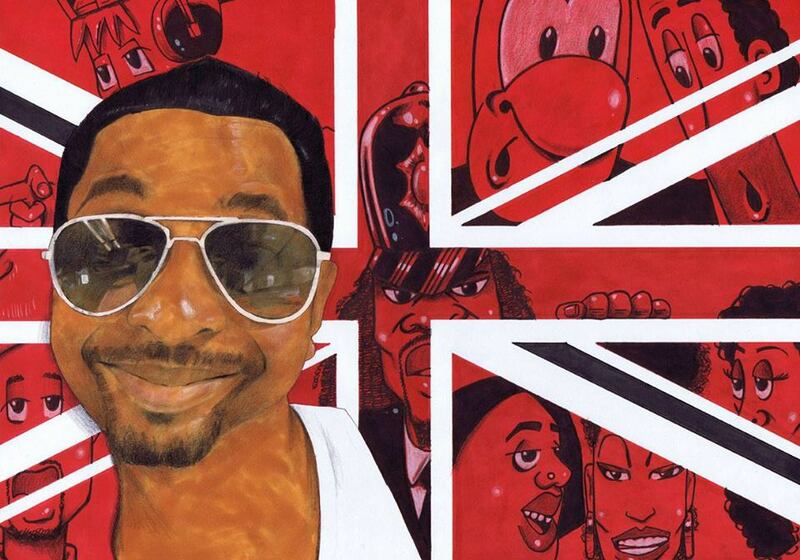 It is the first UK Black, urban graphic novel -- a fully painted graphic novel written by myself, illustrated by Joseph Samuels, and published by Knockabout Comics. 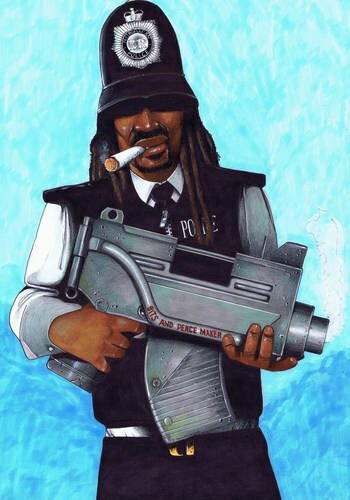 Basically Scotland Yardie is a ganja smoking, no-nonsense bad bwoy cop that breaks all the rules and dishes out his own harsh sense of justice to the criminals of sarth London. It is a Black Lethal Weapon -- a satirical piece about cultural clashes and police brutality on the streets. It riffs on Breaking Bad, it has loads of observational comedy and straight out slapstick. It is a graphic novel that cannot be completely read in one sitting. Well... it can!! But I've thrown in so many gags that it will take a few readings to get them all! 4) What song would you say best represents this book and why? 'I fought the law and the law won'! Ha! I think that Clash song perfectly sums up the graphic novel. 5) If you could get a celebrity – either living or dead – to promote your wares, who would you choose, and why would you want to choose this particular person? 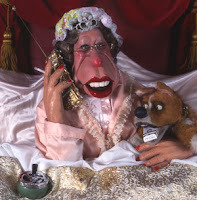 I would like the Queen to promote my book as it would be nice to hear her say 'bumboclart!' every so often. Why I would want her? Man, it would be hilarious as phuck to hear her say urban colloquialisms with a R.P. accent. 6) What have you learnt about yourself through this endeavour? I have learnt to be a lot more respectful to my artist Joseph Samuels, as this guy has gone through the mill with drawing Scotland Yardie. Sometimes as a writer you forget that someone else has to illustrate the words that you throw into a panel. I have asked Joe to illustrate some insane imagery and for the most part, he's forgiven me. When we do this shizzle again (and I'm sure that once the bleeding and the bruising of his fingers have subsided, we will), I'll go easy on him and not throw in anymore one-paged scenes at football stadiums!! 7) During your time in this field, what is the one thing that has kept you in good stead? Smile. Be humble. Be gracious. Don't take yourself so seriously. I respect what I do and I respect what others do. I rarely get phased as I don't sweat the small stuff anymore! It's all good in the hood brah!! 8) If ‘Scotland Yardie’ had a motto, what would it be? Don't mek me tek out me gun!! OK, Bobby. I won't make you do that. But what I'll do instead is thank you for telling us about your new graphic novel, Scotland Yardie, before directing you nice folks out there to Bobby's twitter and Amazon pages.